The beginnings of the Mrzelj family hand weaving date back to 1970. Born in 1947, Majda Mrzelj graduated from Secondary School for Design and Photography, Ljubljana. Employed in the hand-weaving mill Dekorativna between 1968 and 1978, she gained long-term extensive experience as a designer. After the Carniolan Institute for Artistic Weaving in Ljubljana ceased to exist in 1909, Majda, together with renowned Slovenian painters, was the first to rediscover the technological secrets of cardboard-based hand weaving. Since 1980 and until her retirement, she worked as a freelance designer in the field of hand weaving, registered with the Ministry of Culture. In addition to her own exhibitions, she also participated in numerous group exhibitions. It should, however, be noted that a major contribution to her creations was made by her husband Peter, who in 1970 built her a hand loom which still serve their original purpose. Here are a few thoughts that were written when Majda Mrzelj was still actively working. Among the few who committed themselves to weaving one can also find Majda Mrzelj. She uses weaving skills as the basis in fabric making and that alone requires different approaches in view of the fabric usage, choice of the materials, colors, etc. The human habitat surely represents a challenge for this kind of brainwork. The possibilities of exploring the role of fabrics in the environment we live in are endless. She creates the thread as she goes along; different structures are based upon different ways of weaving. The surface becomes the field of countless possibilities of structural changes, which taken as a whole, however, never represent a mere effectual emphasis, are never aggressive, but are dependent on the chosen weaving style, way of binding, thread duplicating. Majda Mrzelj is successful in uniting the fidelity to tradition and modern technological achievements of the profession. Searching for her own unique formulation in a settled design structure, she can adapt to various even the most difficult tasks, intended either for practical or for decorative usage, whether in secular or sacral works. She excels in subtle color combinations, sensibly woven in the contents of the product. Her creativity consents with the intended purpose of the product. From these interlacements of the threads, breathe gravity and zeal, which draw us in only to revive us with their own playfulness. Ethnologist and Professor Janez Bogataj, Ph.D., once noted that one must understand the creations of Majda Mrzelj as the continuing and upgrading of our century-long hand-weaving heritage. So that this would not be just words, I wish – as her daughter, Katarina Mrzelj – to continue or better yet to transfer these weaving skills to the present generation. After graduating (in 1995) from Industrial design on Secondary School for Design and Photography in Ljubljana, I started studying landscape architecture and got my degree in 2003. I am a member of the Slovenian Designers Society. Because hand weaving and everything connected to it has been with me ever since I was little, I see in this a great opportunity to try to give a new form to the old way of working with hand-woven fabric, adapted to the modern man. Each weft placed in the weaving opening is subject to the will of the weaver, to his mood. The fabric can be thick woven as an old cloth or transparently light as fisherman’s net. Either the relief or the smooth surface are emphasized. In each product, one can trace the reflection of the designer’s thought, as shown by the woven fabric texture. How to build on, broaden and perfect traditional techniques of weaving represents such a challenge to landscape architect Kataina Mrzelj that she has decided to research the rules and discover different, yet unknown possibilities theoretically and practically. And as the apple does not fall far from the tree – her mother Majda Mrzelj was a designer and a weaver by profession and her father and Majda’s husband Peter Mrzelj carefully and diligently planed and made looms based on the available museum exhibits – it is no wonder that in the Mrzelj family the looms took over the symbolic function of the hearth. Looms became the central point for socializing and for constructive debates. 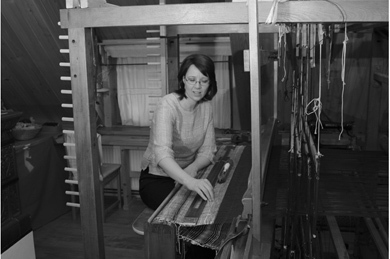 Today the looms are part of Katarina’s home and her studio, they are place of inspiration, creation, joy and work. Majda Mrzelj has retired and does not work anymore, on the other hand her daughter Katarina started weaving in a unique, experimental way by embracing the spirit of the past and bringing it to the present. Although the works of mother and daughter differ both contextually as well as stylistically, the mother focused on tapestry while the daughter is passionate about creating fabric for specific clothes, they both have excellent knowledge of techniques, materials and of weaving as a craft. Many can see and appreciate the knowledge and experience “hidden” in the clothes made by Katarina Mrzelj and many experts openly admit that they cannot understand the technique behind some of her work, done in such a way that there are no deformations or unwanted deviations. Considering that Katarina makes her own fabric instead of buying it, she is certain that the fabric has to be effective in itself. Last year Katarina dedicated herself to thin weaving (gradation from transparent weaving, presented on the left hand side of this leaflet, to thicker and lined weaving). However, this year she is inspired by transitions, which cannot be achieved with industrial weaving; they can only be created by a skilled hand. Katarina has imagined the spring-summer collection in natural materials (linen, cotton, viscose) and to her clients’ delight she has made the maintenance of clothes easy, they can be machine washed despite the high percentage of linen. She has decided to make the colours secondary, she achieves the desired accents with texture. The calm shades of beige, some black, silver and gold thread are play with each other in all three styles: in the formal, where the weaving is thicker and more compact, in the relaxed, every-day clothes and in the clothes for special occasions. According to experts Katarina Mrzelj’s dress from this year’s Viktorji ceremony was one of three most beautiful dresses, which is certainly a great praise and encouragement for the young designer. How could it not be noticed; the dress attracted attention not with colours or cut outs or embellishments but with elegant congruity, fairy-like femininity, kindness, naturalness, with structural details and fine arts accents in the fabric texture as well as with natural materials and their primary colouring. This is, despite the “digital” times we live in, the magic, the magic of archetype, of paradigm, of the original fabric that gave rise to the development of all other forms of fabric. Besides the cuts of the clothes, which show or hide just as much as necessary, the author’s confident style, vision and recognisability speak of stylish elegance for every occasion; of materials which are kind to the skin and easy to maintain, fashion accessories like bags and jewellery, the continuation of tradition kept by our ancestors and of upgrading that tradition at the highest quality levels. A designer of unique designs, a member of the Designers Society of Slovenia Katarina Mrzelj is busy weaving ideas of new creations. She will see us into autumn and winter warmly fairy tale like, as always. This time with a collection full of warmth and colour.